EnergyStar – the US Department of Energy’s green-product certification program – is undergoing some major guideline updates in the next six months, and it could have a big impact on any pending or ongoing lighting projects. Beginning January 2nd, 2017, Energy Star Lamps V2.0 will replace V1.1 as the qualifying directive for all light bulbs sold in the United States. The aim of the new certification standards is multi-pronged: To increase overall efficacy levels (light output per watt consumed), to include some increasingly popular new product types, and to improve harmonization between EnergyStar lighting specifications. Essentially, the new certifications aim to encompass more bulbs and drive even greater energy savings in the lighting world. In fact, according to EnergyStar, if all light bulbs sold in the US next year meet the V2.0 requirements, electricity savings will amount to over $4 billion per year and reduce more than 54 billion pounds of annual greenhouse gas emissions – The equivalent output of more than 5 million vehicles. It is important to note that there will be no grandfathering with the new certifications. This means that all lamps need to be recertified in order to maintain an Energy Star rating, even if they were already qualified under the expiring certifications. The current Energy Star V1.1 certifications will remain in place until January 1st, 2017. After that date, all products will need to have been submitted for V2.0 certification in order to carry the Energy Star logo. One of the biggest changes in V2.0 is an increase in the required efficacy of LED lamps. Efficacy requirements for Omnidirectional, Directional, and Decorative lamps have all increased – Some by as much as 30 lumens per watt (lm/W). Required efficacy is longer based on specific lamp wattages, but rather on the lamp’s CRI, or Color Rendering Index. The CRI of a lamp refers to its ability to accurately render an object’s color on a scale from 0-100 (The higher the CRI, the better the color rendering ability of the product). The tables below outline the new changes for efficacy and light output. Another important change to the Energy Star guidelines involves the rated life for any LED lamps. All Omnidirectional and decorative LED lamps (like A-style or Globe) will now only be required to have a rated life of ≥15,000 hours. This is actually a decrease in the rated life requirements from V1.1, as Energy Star shifts its focus away from the life of these products and toward the everyday efficiency of the most popular types of lamps. 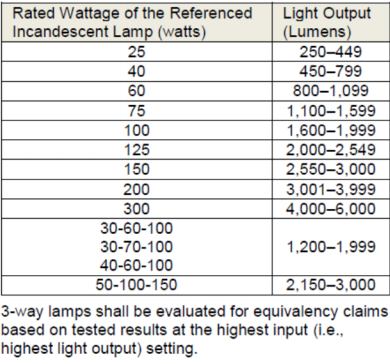 All directional LED lamps (like BR or PAR styles) will still be required to have a rated life of ≥25,000 hours. Along with some updated efficiency and output guidelines, Energy Star is also adding a few new lamp styles and bases to the approved products list. One of the most notable additions is the ST style LED lamps, more commonly referred to as Filament or Nostalgic lamps. This type of decorative product typically fits well in a restaurant or hotel setting, where a warmer or homier feel is desired. In order to recognize this type of lamp, Energy Star is adding lower CCTs, or Correlated Color Temperatures, to the approved spectrum. The CCT of a lamp refers to the way the color of the light is perceived – A lower CCT implies a warmer or more yellow color, like the Filament style lamps produce, and a higher CCT implies a cooler or more blue-toned color like you might find in an office space or industrial setting. Also eligible within the new guidelines are the much smaller G4 and G9 base LEDs, which are typically installed in desk lamps and decorative or under-cabinet fixtures. Increasingly popular color tunable and other “connected” lamps will now be recognized as well. These products allow the end user to control light output and color, typically via Bluetooth or other wireless connection. But while manufacturers will be adjusting their production and updating their product lineup, what does it mean for the consumer? The newly rated Energy Star V2.0 products will certainly be more efficient, and will still carry Energy Star logo that everyone has come to know and love. However, it’s important to understand the process involved in this type of a change. Since Energy Star is not grandfathering in any previously approved products, all manufacturers will need to submit their eligible products for recertification. Many products that are currently available and Energy Star approved may not meet the new requirements, and will fall off the eligible products list. Manufacturers may choose to not recertify certain products that are currently qualified, and any new products released to meet V2.0 requirements could carry a higher price tag to go along with their improved specifications, at least temporarily. If you are in the middle of a lighting upgrade project, or if you’re considering taking the first steps toward re-lamping your facility with the help of a utility-funded rebate program, now might be a good time to put that first step forward. Utility-funded rebate programs around the country rely on the list of Energy Star-qualified products as the basis for the incentives they offer. While manufacturers are in the process of updating and recertifying, many products that are currently eligible for utility rebates may disappear from the qualified list, and so will the rebates they carry. That’s not to say all of the products that are eligible now won’t meet V2.0 requirements – In fact, many of them will. But the process of recertification takes time – six months or more – and the timing of your lighting project could be greatly affected by lamps falling off the Energy Star qualified list, even if they do eventually return to the list. The qualified products list will certainly regrow to its current size over time, but it will undoubtedly be a much shorter list at the beginning of next year than it is right now. So if you’re thinking about upgrading your business to LEDs with the help of a utility-funded instant rebates – What are you waiting for? By January 2017, your pool of available products could be much smaller than it is right now which could limit both your opportunity and the amount of money you could save on the project while the Energy Star qualified products list begins to regrow with new requirements. Or if you’re thinking of picking up some filament-style or “smart” bulbs for your business, take a look at the upcoming requirements and see if anything you’ve had your eye on is due for an Energy Star rating in 2017.